Thread: Major Auction House Steals tonight!!! VINTAGE! That I won a 1936 World Wide Gum Joe DiMaggio RC SGC 60= PSA 5 for 6500 total. A PSA 5 ended for 11,600 in September! 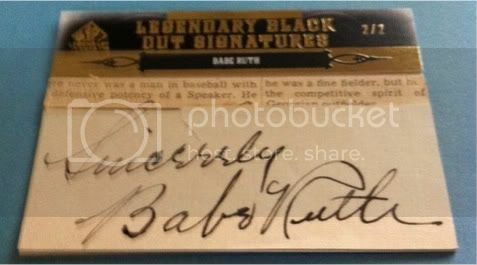 In addition, I won a 1922 Caramel E120 Babe Ruth PSA 3 for $2000 total and a PSA 2 went for 4200 recently! Needless to say, Im pumped!!! Re: Major Auction House Steals tonight!!! VINTAGE! I hate that they continue to refer to that issue as DiMaggio's 'rc'. It's always tricky with pre-war, but the general consenus is that the Zeenut is the rookie. First issued in 1934. Tough piece. wow congrats! thats quite a difference in your 36 price tonight and the september price. what do you think the difference was? the auction house? lack of the ebay buyer base? economy? i only ask because of the importance of that card you would figure to have the same bidders the other did and maybe more intelligent and fiscally powerful buyers at a legitimate hammer dropping auction. congrats again on the big wins!!! I hear ya, but some consider the Zeenut as a Minor League card. I like the 1936 World Wide Gum because he's wearing a Yankee cap and in a Yankee uniform! That is a couple amazing pickups. Scans soon we all hope. Glad to see someone who likes it old school, I've made the shift to the players playing today. I'm a sucker for an autographed card, but Im very happy to see people still dishing out solid money for the original baseball cards. Pre-mass production. I always feel with the exception of Robert Edwards Auctions, you can find many steals in these auction houses! Its crazy because it was one of their featured pieces and they had the Estimate at $10,000+ and usually those estimates are conservative. Well, maybe the fact that this is a religious week for many and schools are off and people are on vacation with their kids possibly. I also think that with the exception of Robert Edwards Auctions, you can find absolute steals in these other auction houses maybe because they dont have a huge buyer base! WOW. INSANE pickups man! Gotta celebrate tonight, congrats! The 1936 V355 DiMaggio is an impressive card, 50-100 times scarcer than a common Goudey Ruth of the same Era. I too say the Zeenut is his rookie, batting or throwing, but others say the V355 is too because its the first as a Yankee and not a PCL Seal. Its the same with the Balt News Ruth and the M101-4/5 Ruth. pick what you want. I always say the oldest card as a Pro is his rookie. here is the "throwing" DiMaggio, picked it up on eBay a few years back for $1200.